At the end of 12th Century in a northern part of India, few dynasties came to power making Delhi the centre of their rule. These dynasties were ‘Mamluks’, ‘Khaljis’, ‘Tughluks’,’Sayyid’ and ‘Lodis’. The rule of these 5 dynasties came to be collectively called as the Delhi Sultanate. The given gold square tanka belongs to Qutb-Al-Din Mubarak, the last ruler of Khilji dynasty. Khilji dynasty was a Muslim dynasty of Turkish origin. Qutb Al-Din Mubarak ruled Delhi from AH 716 to AH 720. Qutb Al-Din Mubarak had issued coins in gold, silver, copper and billon. According to his mint master Pheru, he created 44 different denominations, which contained more than 70 different types of coin during his four years long reign. But, many of these types are not known. For the first couple of years of his reign, he issued coins in round shape. But, from the year AH 718, his coins were struck in the square shape. 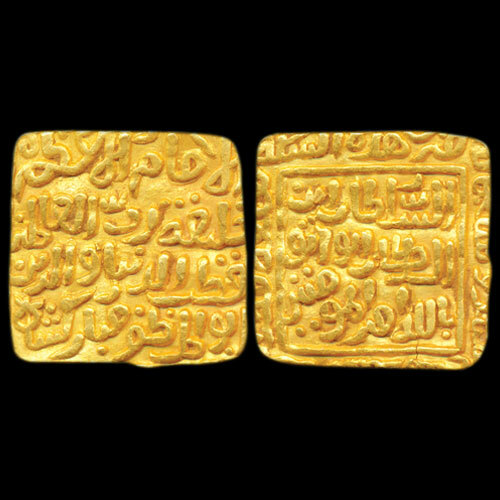 This gold square tanka was minted in ‘Qila Qutbabad’ and it weighs around 10.9 g. The obverse of this coin is inscribed as ‘Al Imam Al Azam Khalifa Rabb Al Alamin Qutb Al Dunya Wa'd Din Abu'l Muzaffar Mubarak Shah’. The reverse of the coin is inscribed as ‘Al Sultan Ibn Al Sultan Al Wathiq Billa Amir Al Muminin’ within a square border, AH date 719 and the mint name ‘Qila Qutbabad’ written in the margin. This very rare gold tanka is listed for INR 2,00,000 at Todywalla Auction which will be held in Ahmadabad on 9th February 2018.